Relentless litigation... again - As demonstrated by the case Lindner v Rawlins. Completing the circle - Confirming the obvious: those who provide legal advice will have to be trained, regulated and insured. 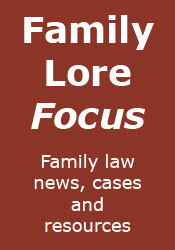 Breaking the cycle of incessant litigation - A few ideas that might help. The complexities of modern family relationships - As demonstrated by the case C v S.